Senior Alexandra Brockdorf has always been curious about how people’s minds work. At Florida State University, she’s gained insights about those questions through her research on eating disorders and her work as a suicide hotline counselor. Brockdorf chose to attend Florida State because of the university’s emphasis on academic life and its unique research culture. She was inspired by the passion and enthusiasm that she saw in other FSU students. “I felt like I would not only be supported but encouraged to unapologetically pursue my goals here at FSU,” Brockdorf said. The Jacksonville native said she always had a deep-seated interest in why people behave and feel the way they do, so she decided to major in psychology. Looking back, it was the right choice. 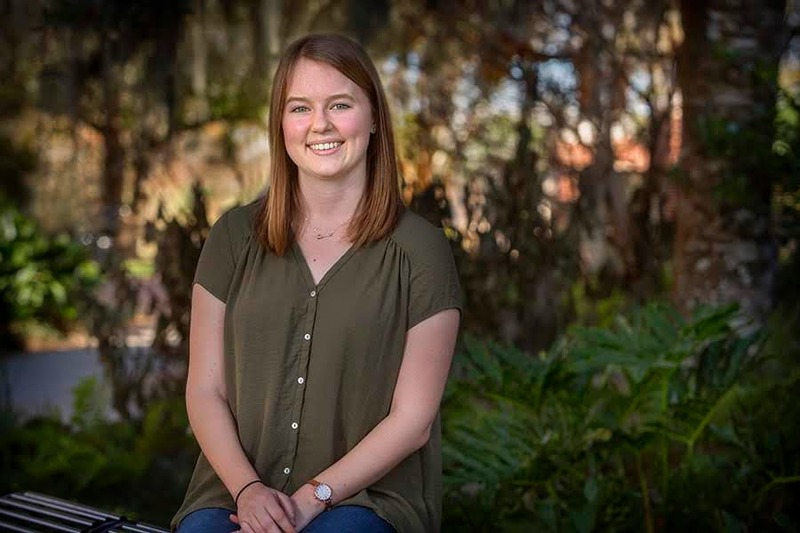 As a freshman, she participated in the FSU Undergraduate Research Opportunities Program (UROP), where she had a chance to connect with research projects and faculty members, including Professor Pamela Keel in the Eating Behaviors Research Clinic. Brockdorf studied sensitivity to punishment and self-perceptions, as well as eating attitudes and behaviors. She investigated the link between a person’s shame and risk of developing an eating disorder. Her project concluded that finding ways to address a person’s shame could present one approach to preventing disordered eating. She expanded on that research in her honors thesis and presented the findings at national conferences and meetings. Her findings were published in the journal Eating Disorders, and the work earned second place in Florida State’s annual Howard D. Baker Undergraduate Research Award competition. Recently, Brockdorf successfully defended her honors thesis. Joe O’Shea, assistant provost and assistant vice president of academic affairs at FSU, said Brockdorf stood out among her peers because of her intellectual capabilities and desire to learn. In addition to her research, Brockdorf completed more than 200 hours of volunteer work with 2-1-1 Big Bend as a hotline crisis counselor, where she was responsible for providing short-term crisis counseling to people in need, referring them to the proper organization for long-term help and answering the National Suicide Prevention Hotline. She also was recently hired by FSU’s Victim Advocate Program to serve as an on-call advocate — the first undergraduate student ever hired for the job. Her duties include helping FSU students who’ve been victimized and making sure they get the support they need. As a freshman, Brockdorf also participated in the FSU Global Scholars Program, which helps students secure summer internships at nonprofit organizations in developing countries. She spent the summer of 2015 in Ghana, volunteering at a hospital. She also helped fundraise and implement a system that dispensed clean water in a rural elementary school. The work was coordinated through HCDP Ghana, an organization dedicated to improving the quality of life in rural areas of the country. Brockdorf’s countless hours dedicated to research and volunteer work have not stopped her from excelling in the classroom. She currently holds a 3.9 GPA and has made the President’s List. In addition, she served as a leader in UROP, mentoring freshman and sophomore students to help them build confidence personally and in their research abilities. Her experiences as a UROP leader have enabled her to come full-circle and give back to the program that sparked her interest in research. After graduation, she plans to pursue a Ph.D. in clinical psychology. Her ultimate goal is to work as a professor and continue conducting research. Brockdorf is grateful for her time as a Seminole and the opportunities and experiences that came with it.